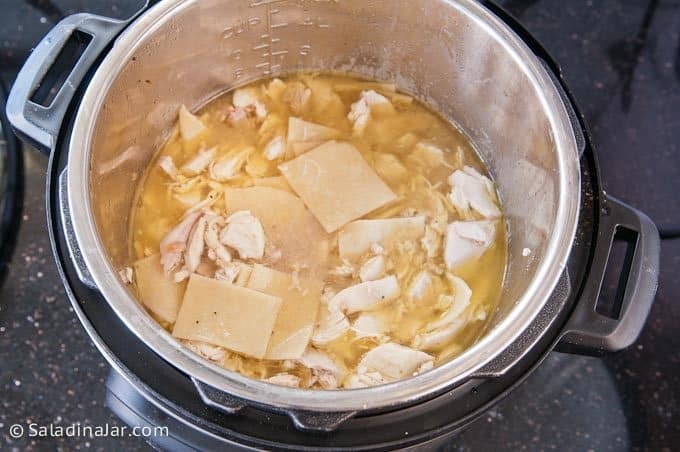 Never-Fail Chicken and Dumplings will show you how to prepare the perfect chicken and broth for homemade dumplings in an Instant Pot. Directions for mixing the dumplings in a food processor and rolling them out are also included. 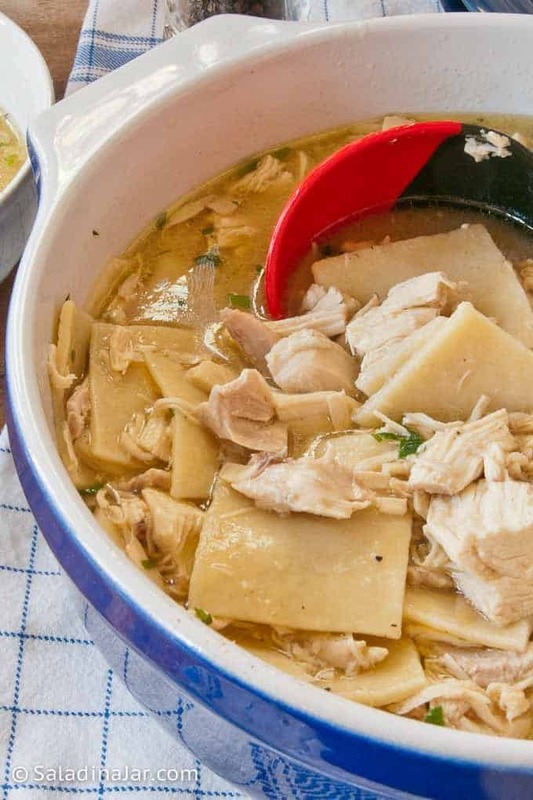 If so, you must give these easy Never-Fail Chicken and Dumplings a try. I can think of no better way to chase away goosebumps. Now don’t be thinking this recipe is just too much trouble. For one thing, the noodles don’t have to be perfect. Handmade equals character! 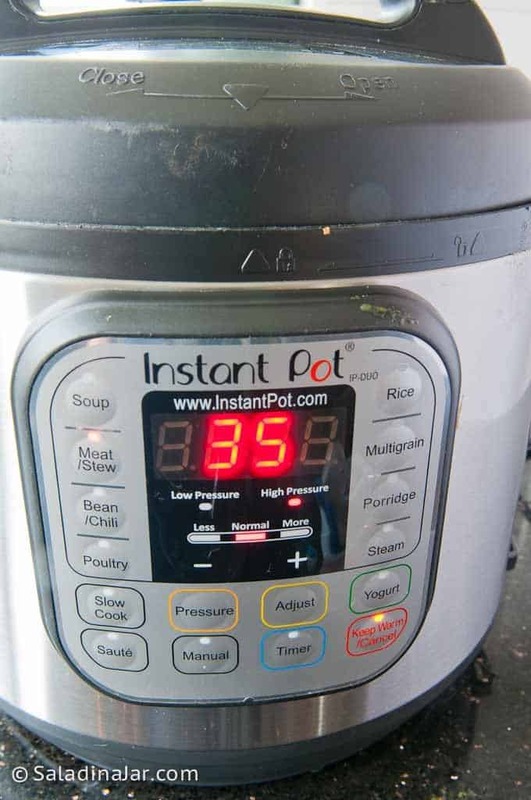 Not only is the broth easy with an Instant Pot, but it can be prepared ahead of time. In fact, it’s better that way so you can easily remove the fat layer from the chilled stock if desired. Not into making your own dumplings? 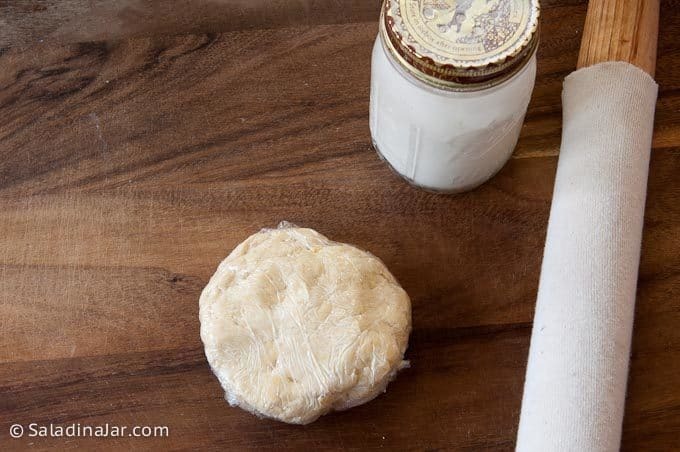 Try cutting flour tortillas into squares. Or cut up some canned biscuits and drop them in the broth. 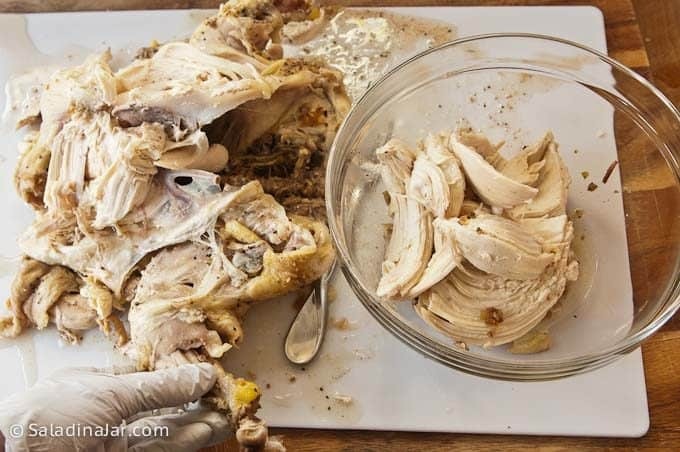 Even if you prefer fluffy biscuit type dumplings or the ease of cut-up flour tortillas, you must try this method for cooking a whole chicken. The seasoning is simple but divine. 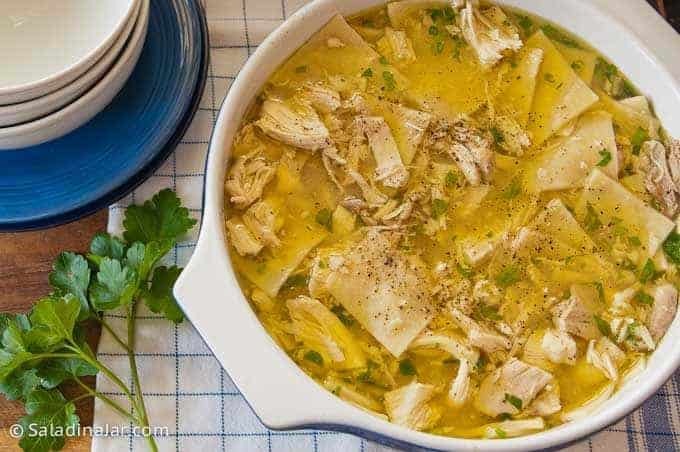 This recipe will work for any recipe calling for cooked chicken such as this Rotisserie Chicken and Mushroom Chowder or casseroles such as Cheese-Crusted Creamed Chicken and Chips. The broth is perfect for egg noodles. Place a rack with handles inside your Instant Pot, then whole 4-5 lb. chicken. Pour 4 cups chicken broth over chicken. 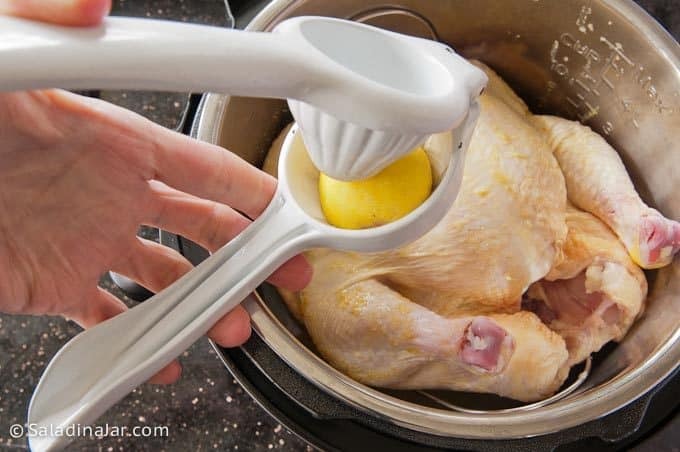 Squeeze a lemon over the chicken. Season chicken with lemon pepper and salt. 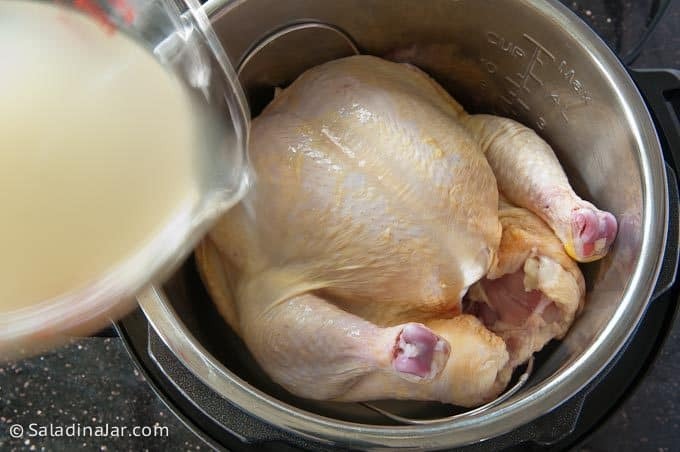 Set Instant Pot to 35 minutes (40 minutes if chicken weighs more than 4.5 pounds). When finished, allow for natural release of pressure for at least 15 minutes. 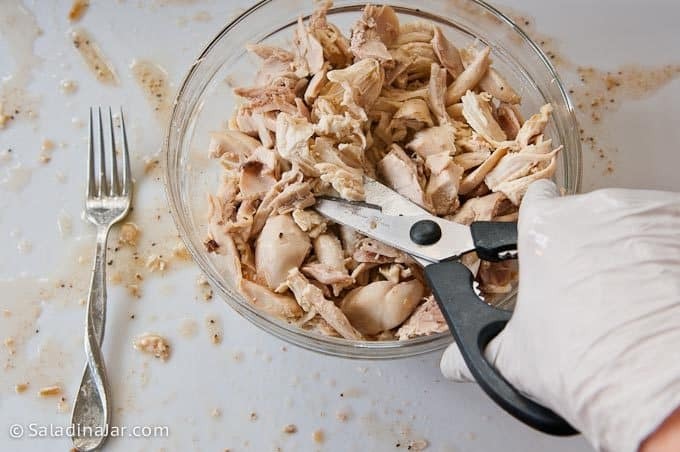 If you have kitchen shears, use them to cut up the chicken in smaller pieces. It’s quicker than getting out your chopping board or shredding by hand. 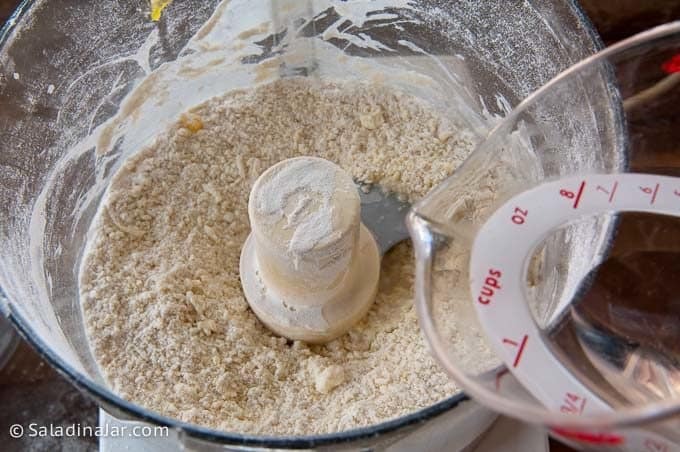 Measure dry ingredients into your food processor bowl. 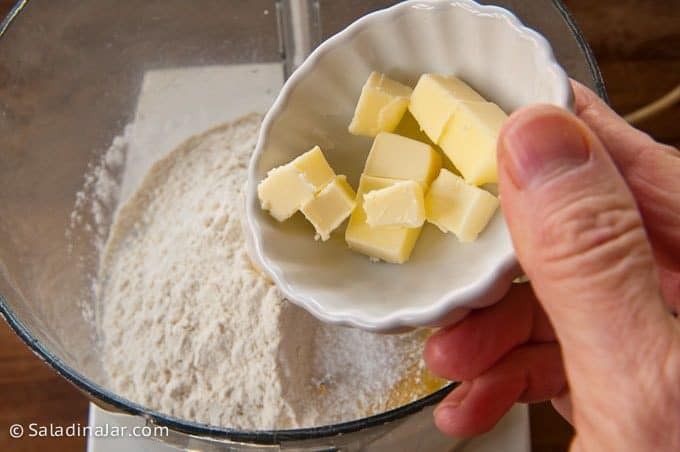 Add eggs and butter to dry ingredients. Pulse 4-5 times to cut in butter. Pour water into the processor bowl. Process until you can mash dough with your fingers and it sticks together. It should not be sticky. 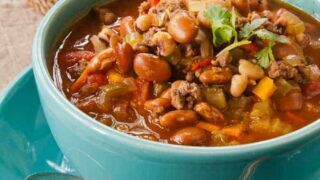 If sticky, add another tablespoon of flour and pulse several times. Check consistency. 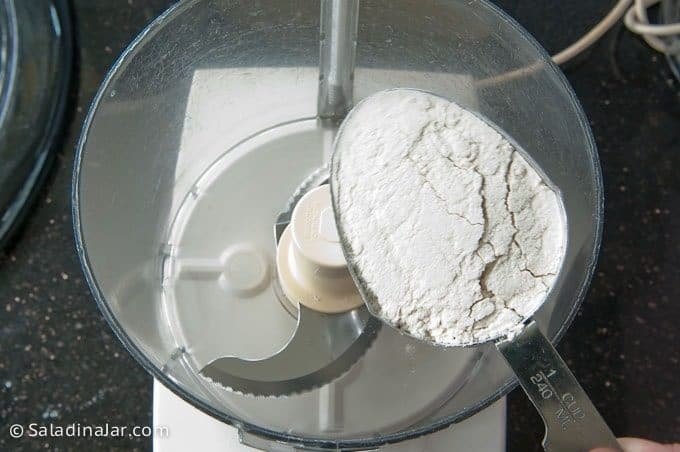 Gather dough into a small disk shape and flatten. Wrap in plastic wrap and allow to relax for 10 minutes (longer is OK). 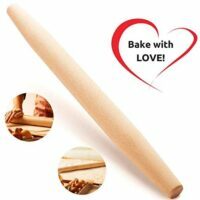 Roll out dough very thin and let the sheet of dough dry for about 20 minutes. Cut into smaller squares. A pizza cutter makes fast work of cutting the dough. Set Instant Pot on the Sauté setting until broth comes to a rolling boil. Drop dumplings into broth and allow to cook about 10 minutes. Add chicken and continue to cook until heated through. Serve hot. Garnish with chopped parsley for a fresh taste and visual appeal. A delicious way to use leftover roast pork with directions for making in an electric pressure cooker. Clean chicken inside and out thoroughly. Place rack with handles into the bottom of Instant Pot. Then place chicken onto rack. Stir warm water and bouillon together. Pour over chicken. 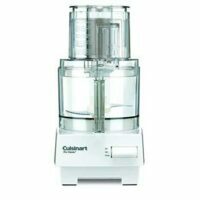 Add all ingredients to a food processor (my preference) or use an electric mixer. Mixture may look like coarse cornmeal or could be soft dough depending on weather conditions, humidity, size of egg you used, etc. 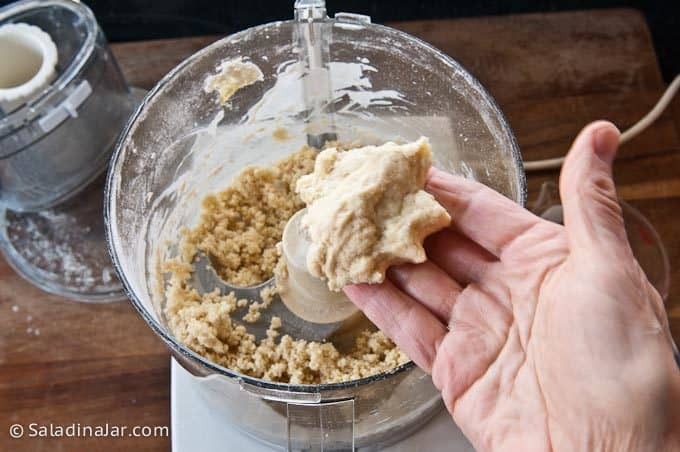 If dough does not come together, press it into a ball with your hands. If it still will not stick together add water a few drops at a time. Once you can press it into a ball, you're good. Form ball of dough into a flat disc, cover and allow to rest for 10 minutes. 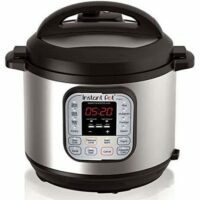 Turn on the Sauté function on the Instant Pot and bring broth to a rolling boil. 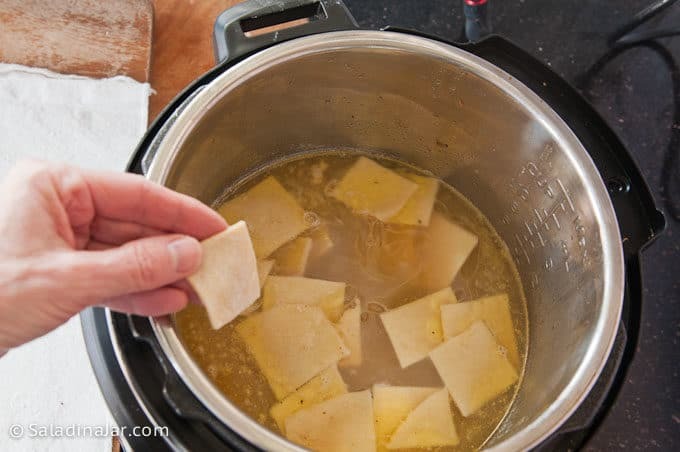 Cut dough into small strips and drop in boiling, rich chicken broth. Cover pot and simmer about 10 minutes. Add chicken and continue cooking until hot. 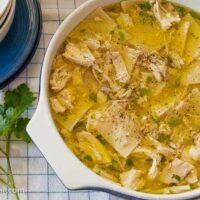 If you are not planning to eat your chicken and dumplings immediately, you will need to add water to make a soupy consistency. 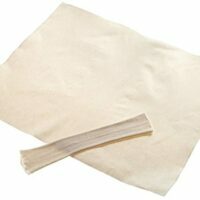 Just like any pasta dish, the pasta absorbs the liquid as sits in the broth. 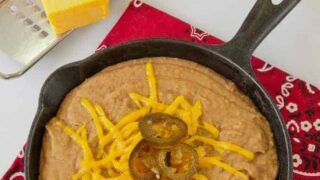 If I don’t have a Dutch oven, what do you suggest? And what should oven baking temp be set to for that 2.5-3hrs? Use any large pot big enough to hold your chicken. I don’t bake it. I simmer it on top of the stone on low to med-low heat. I’ve never done it in the oven. Maybe set it on 300? Just an idea. Made this for dinner tonight and it turned out wonderful! I used crockpot for chicken and it turned out great! Thanks for a great recipe! Tomorrow I’m trying mushroom chicken meal from your site too. I’m new to the site, and loving it so far! I don’t have a dutch oven. Is there another way to make the chicken? In a stock pot? 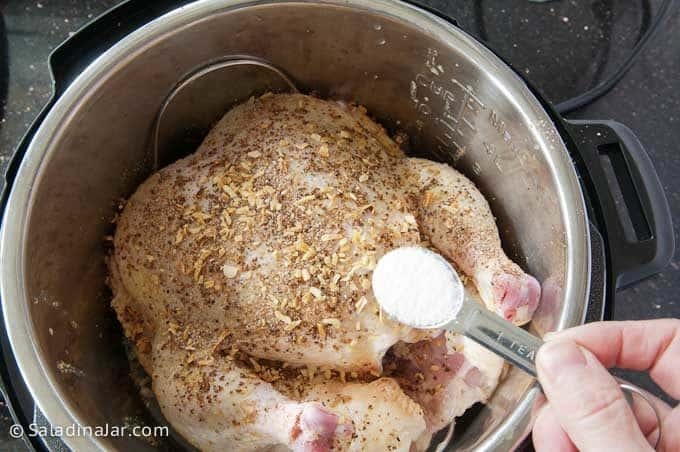 What temperature do you cook with on for the chicken in the dutch oven? well I said I would get back about my attempt at the chicken and dumplings. I definitely need some more practice. As good as the chicken smelled cooking in that rich broth for the dumplings later, it was toooo salty. 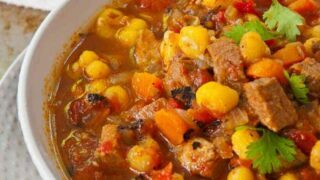 For one thing I used beef not chicken bouillon and that jarred kind you recommended in the hearty beef and ham stew. Opps! My dumplings after tasting them fully cooked were doughy. 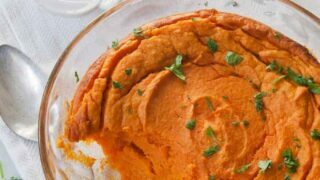 To change the subject do you have a yummy dip for vegetables? Thank you so much for all the good recipe ideas Paula! Good question Susan, I don’t really think the size matters all that much. You will have more chicken if you go large. I’ve never paid attention but the next time I make this, I will and note it on the recipe. I love the clearer broth with your C and D. I love making C and D. Especially when it’s cold. Love your new header. It is new, right??? It’s 10 degrees here tonight…. please send a few bowls up my way! Wow… I’m so impressed with the preparation and presentation. These look phenomenal… AND might I say, quite delicious and “comfort-food” good! Paula this looks delicious and very different from the chicken and dumplings I grew up with. I’ll be trying it soon.